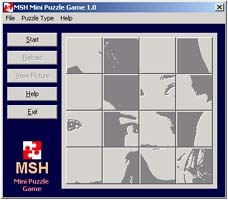 This is a puzzle game and it is freeware. You can freely distribute to your friends. It is mainly developed for children and for the beginners of computer operation. This will help them to improve their mouse movement. But anyone can play it and have fun. It is the first edition of the game. In this edition I have included 5 pictures’ puzzle. Hope you will enjoy the game.